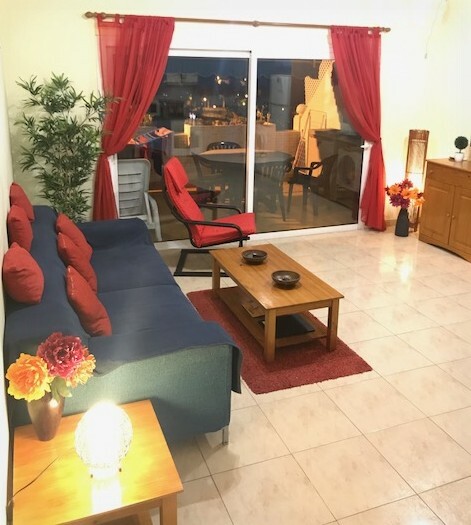 This is a beautiful and spacious two-bedroom holiday apartment with a heated roof-top pool and a large balcony. 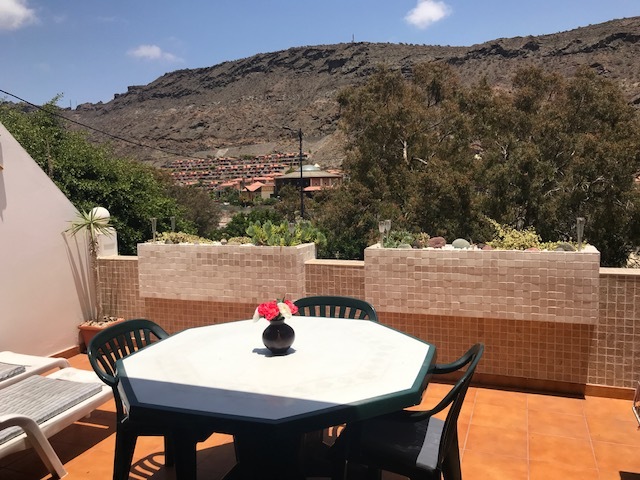 It's just a five-minute walk from the golden sandy beach, lots of fabulous restaurants and the picturesque harbour area of Puerto de Mogan. There are two good supermarkets nearby, where freshly baked bread is available every morning. 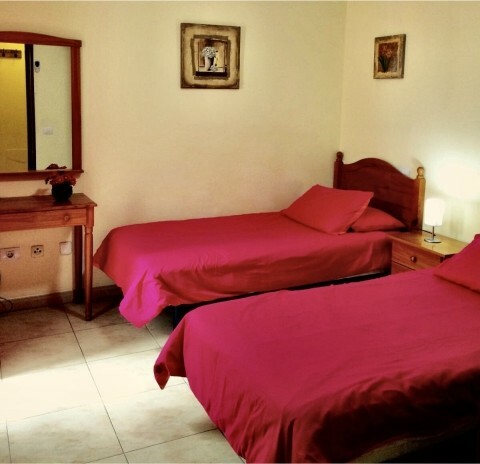 With a double bedroom and a twin bedroom, the apartment will sleep up to four people. 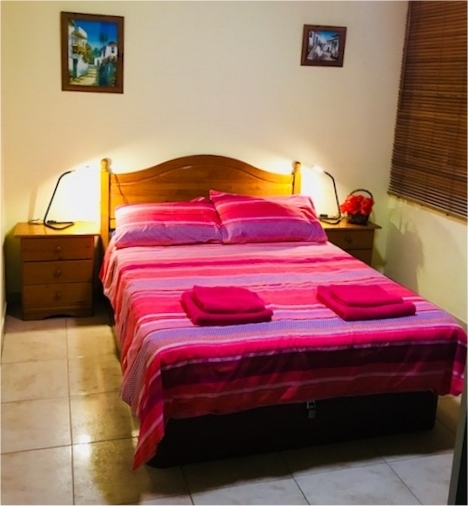 It's fully equipped to make your stay relaxing and comfortable, with air-conditioning and ceiling fans, a full-sized oven and hob, a full size fridge-freezer, a microwave and a washing machine. 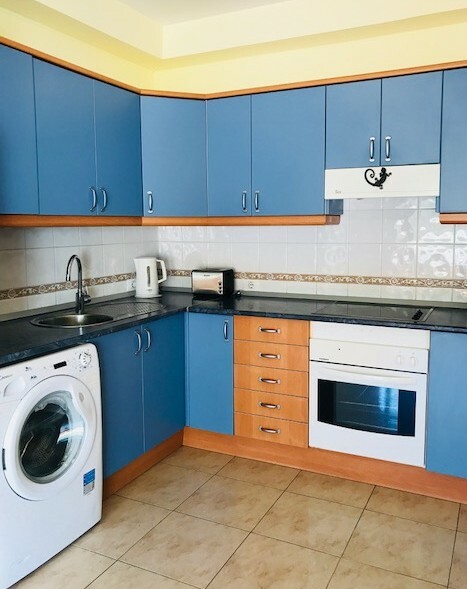 We also provide a hairdryer, iron and ironing board, and there's a safety-deposit box for your use. The large private terrace, which gets the sun from first thing in the morning to mid-afternoon is furnished with a table and four chairs and two sun loungers, and if you want some shade our new awning is just the thing. For entertainment there's a 40" HD flat-screen TV with around 100 channels, including UK satellite channels such as BBC, ITV and C4, a DVD player and free high-speed wi-fi. We have a large collection of books, so you're sure to find a good read while you're here (you're welcome to take a book home with you if you haven't finished it). In case all that isn't enough to keep you occupied, there are also board games and playing cards in the apartment. The apartment is on the first floor and has an entry-phone. 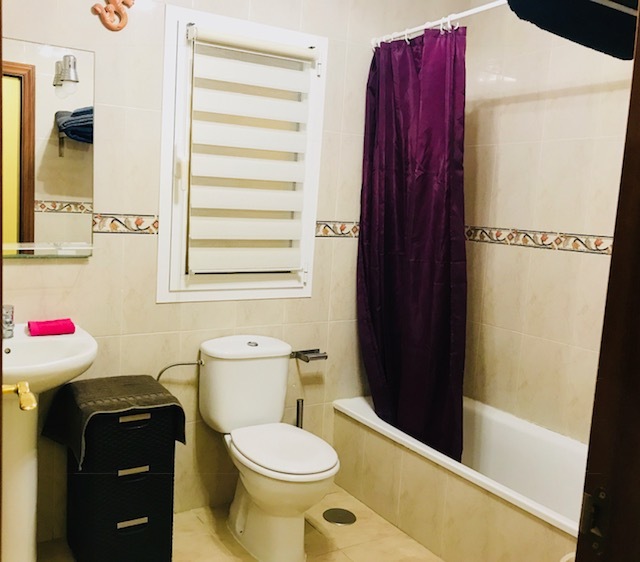 Access from street level is by stairs or lift and there are no steps inside the apartment, so all the rooms and the balcony are easily accessible. Please note: that the pool is not accessible via the lift, only by a flight of stairs. 23 apartments on two floors share the fabulous roof-top pool, which is heated during the cooler months. 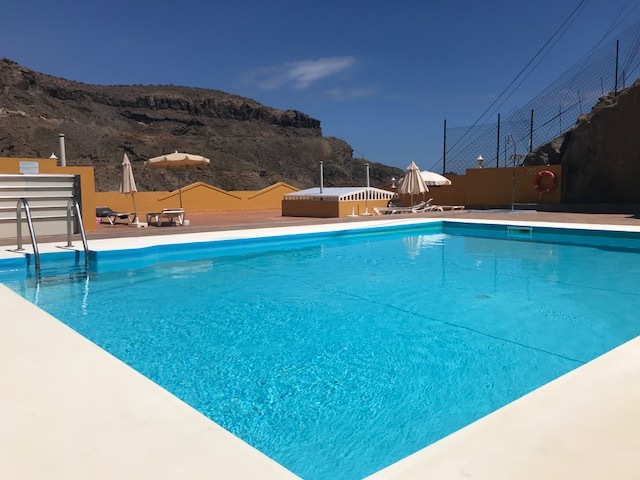 Sun loungers and parasols are provided free of charge on the large sun terrace around the pool and there are poolside showers, toilet and changing facilities. All linen and towels are provided and changed weekly. We have cots and high chairs available on request; please ask for further details if you require them. We hope you'll find everything you need for a relaxing holiday, but we're happy to take suggestions for new equipment and we regularly update it to keep everything fresh. For details of prices and availability and to book the apartment please email the owner. We do not accept liability for any cancellations or accidents or incidents during your stay at the apartment so we suggest you take out separate travel/holiday insurance.